Technology continues to replace jobs at unprecedented place and every estimate only predicts this number to exponentially increase. So, as many college students flock to computer science majors, middle and high schools are not adequately preparing the next generation for a fundamental change in the job market. Thankfully, PlayDNA has made its mission to fix this. With their complete curriculum including computer science, genomics, and other subjects, principals can seamlessly integrate STEM into their school and prepare their students for the future. AlleyWatch spoke with CEO and cofounder Dr. Sophie Zaaijer about the young company and how they got started. We live in a data-intensive society. But are we truly training our kids to be ready for being part of the workforce of the future? PlayDNA teaches data science to middle- and high-schools using an innovative curriculum that involves hands-on experience with portable DNA sequencers. We give the students relevant questions and projects that engage them to seek the answers. PlayDNA goes from natural DNA bases to computer bits and bytes. And from bytes, we go to data interpretation. All steps use data science as a vehicle, not as a goal. Each step in the curriculum will open students’ eyes to the world around them. We prepare the next generation to be citizens in this data-intensive world. 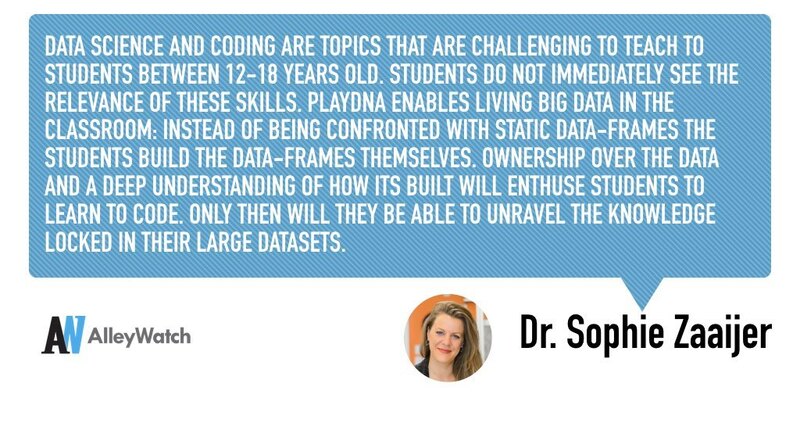 Data science and coding are topics that are challenging to teach to students between 12-18 years old. Students do not immediately see the relevance of these skills. PlayDNA enables living big data in the classroom: instead of being confronted with static data-frames the students build the data-frames themselves. Ownership over the data and a deep understanding of how it’s built will enthuse students to learn to code. Only then will they be able to unravel the knowledge locked in their large datasets. PlayDNA is unique in teaching data science hands-on, and unique in bringing DNA sequencers into the classroom. This is the first time in history that 12-year olds sequence DNA themselves and infer information from the biological data in the classroom. We focus initially on K7-12 classrooms. This market totals around 17 million students nationwide. The more schools we engage as clients the more meaningful the projects we will be able to do. PlayDNA aims to organize large citizen-science initiatives nation-wide that empower the students to participate in real science projects. Students will not do the experiments just for the sake of learning, but they are learning in addition to contributing to science. The idea for PlayDNA came from the success of a genomics and data science class we provided for Columbia University undergraduate students. We won a Hybrid Learning award from Columbia University that encouraged us to further develop methods to improve hybrid learning in universities. We realized that we did not only want to teach undergraduate and graduate students who have already chosen a career path involving computer science or genomics. We realized that bringing this method to middle- and high-schools would be more effective in teaching students widely applicable analytical skills and give them a glimpse into the potential of these fields. Would you mind telling us about some of the interesting findings from the pilot that you have been running at the Village Country School? We are very fortunate to have the Village Community School (VCS) as our partner. The VCS is an example of a school where teachers give high quality education to children through K-8. Our experience in our pilot with 7th grade students has been that 12-year olds are open-minded and keen to learn. Their minds are not locked into liking just one field per se – this is the moment to give them a curriculum like PlayDNA’s where coding, data science, biology and genomics are all integrated in an overarching project. I am going to start as Runway Post-doc in Cornell Tech starting in August – this means I will dedicate all my time to bringing PlayDNA to the next level. Yaniv Erlich will be based in Israel, and will be advising PlayDNA to make it a success. The scientific community: this community stimulates creative thought and drives us to design meaningful projects for the students. We also have Oxford Nanopore Technologies (the manufacturer of the portable DNA sequencer the MinION) as our neighbor, with whom we have excellent relations. The schools: NYC has so many top-notch schools like the VCS. Being close by means we can give schools personal attention where needed to make PlayDNA a product that everyone loves: schools, teachers and students. The education field: a NYC-based company we admire is LittleBits. This is a company that has a vision similar to ours: a hands-on, kit-based, fun, do-it-yourself approach to learning about complex concepts. Also the DNA Learning Lab based in Long Island (Cold Spring Harbor Laboratories) is close by. They have many years of experience in teaching genomics and are a true inspiration. The EdTech community: there are many EdTech startups based in NYC. We can learn about effective ways to grow and develop as a business. We aim to get investors that really embrace our method and want to help to bring PlayDNA to the next level. Cornell Tech is based in NYC and runs the Runway Postdoc program, which is a unique program that allows us to develop PlayDNA and launch a high-end curriculum that will bring STEM education to the next level. In conclusion: NYC is the best community we can wish for. I lived in the UK for 5 years and developed a soft spot for pub-like bars. For me the V-bar on Sullivan Street has that atmosphere. There is nothing like a draft of Flower Power ale at the end of the day with some friends.